Legendary Swiss watch brand IWC Schaffhausen, after the successful launch of remarkable series of Pilot watches this year, presents an exclusive special edition Pilot’s Watches for Father and Son. With the Big Pilot’s Watch and the Pilot’s Watch Mark XVI, father and son retain their individuality while demonstrating a mutual passion for the exquisite. These two unusual timepieces form a perfect family unit and are symbolic of a fascination with precision engineering and aviation handed down from one generation to the next. In 2012, the year of the Pilot’s Watches, the watch manufacturer renowned for masculine timepieces is launching its second special edition since 2008 for the men in the family; or – to retain the language of flying – the pilot and co-pilot. In life, as in the cockpit, it is a question of being able to rely on one another and of giving the junior member of the team an increasing degree of responsibility. Fathers pass on to their sons vital personal qualities, such as self-confidence, ambition and a sense of responsibility. And not infrequently, a father’s enthusiasm for engineering and perfect craftsmanship will be inherited by the younger generation. For fathers, the model of choice is the Big Pilot’s Watch with power reserve and date display. With its impressive 46-millimetre case diameter, it is one of the seriously big players in its field. In watchmaking terms, it goes way beyond conventional limits: the automatic 51111-calibre movement with its spring-mounted rotor and Pellaton pawl-winding system builds up a power reserve of 168 hours. The power reserve of the mainspring would last even longer, but the movement is stopped automatically after 7 days to ensure the requisite high level of precision. The smaller edition for the son, with its 39-millimetre case and automatic 30110-calibre movement is, technically speaking, virtually identical to the Pilot’s Watch Mark XVI. This functional timepiece has a 42-hour power reserve and, apart from the time, also shows the date. Water resistance to 6 bar and a glass secured against drops in air pressure make the Pilot’s Watch for sons a reliable everyday companion. Even if the technical specifications of the two models differ, the visible similarities are unmistakable. Both watches have a stainless steel case, an eye-catching crown and a black, riveted alligator leather strap. The shape of the hands, outlined in black, is reminiscent of propeller blades. The inner surface is coated with green luminescent material to guarantee optimum legibility against the rhodium-plated dial. 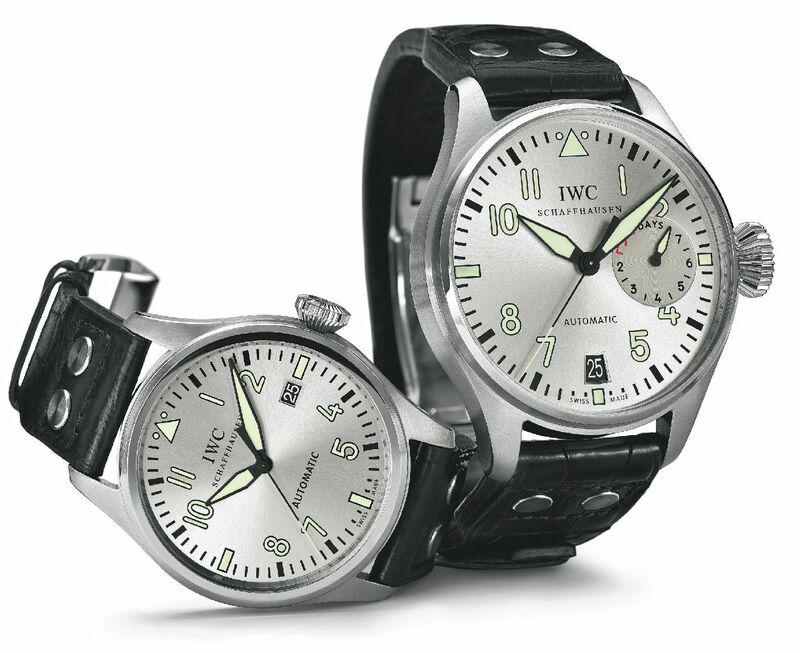 The Big Pilot’s Watch is fitted with a folding clasp while the Pilot’s Watch Mark XVI comes with a pin buckle as standard or, at additional cost, with a folding clasp. It is a hallowed tradition to present the people who mean the most to us with valuable timepieces. Whether as a sign of affection, out of recognition for special service or in memory of a joyful occasion, watches are simply one of the most personal gifts of them all. In this respect, the Pilot’s Watches for Father and Son send out a clear signal. 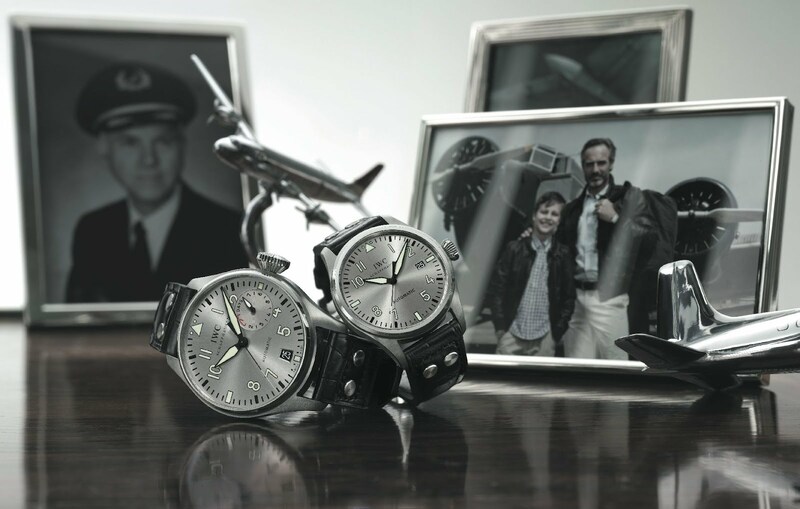 Inscribed with a dedication, both the Big Pilot’s Watch and the Pilot’s Watch Mark XVI become valuable family heirlooms that can be passed on from one generation to the next. The inner circle on the case back of both watches is reserved for the engraving of a name, as a stylish dedication and to prevent mix-ups: a practical feature, because this Pilot’s Watch set can be extended to include several watches for fathers with two or more sons. Special Features: Mechanical movement, Pellaton automatic winding, date display, power reserve display, central hacking seconds, Glucydur® beryllium alloy balance, Breguet spring, screw-in crown, glass secured against displacement by drop in air pressure. Special Features: Mechanical movement, self-winding, date display, central hacking seconds, screw-in crown, glass secured against displacement by drop in air pressure.